‘This is Halloween, everybody make a scene’. Or so commands Jack Skeleton from Tim Burton’s 1993 film, The Nightmare Before Christmas. 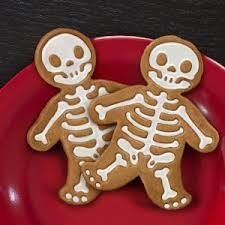 Well in our little 3D world, if it’s Halloween then we exhort everybody to make baked goods! Or scary 3D printed decorations. Doesn’t trip off the tongue does it? Oh well. Fireworks v Bonfire, Noughties v 1970’s!! We’re getting ready, for what, in my childhood, was a non-event. We went mad for firework night – or bonfire night as it was called then. After all, the whole point of the 5th of November (and it was only ever on that day), is to mark the date that Guy Fawkes got himself caught in the act of trying to topple the government via the failed 1605 Gun Powder plot. 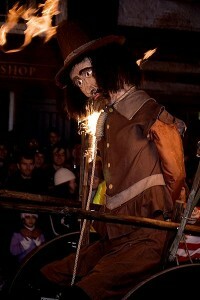 Mr Fawkes had several fellow plotters, but, it was he the authorities found guarding the gunpowder. Hence his name became forever associated with this episode of British history. So yep – bonfire/firework night was a big deal. We held a huge family party with fireworks in milk bottles. This was the 1970s and no-one had yet invented health and safety. But we didn’t bother with Halloween. Except to hide under the bed covers. It’s a common belief these days that Halloween, or if you’re going to be ‘proper’ about it ‘Hallowe’en (because it’s a contraction of ‘All Hallows’ Eve’) is an American import. But, in actual fact WE exported it to the US. Trick or Treat as we know it, has heavy American influence yes, though it exists/existed here in other forms, in some parts of the country. If all this has piqued your interest in the history of All Saint’s Eve (another name for it) we recommend this four-minute Trick or Treat read from AA Editorial Services – aka – Angela Atkinson. Part of the excitement for Halloween in our house is the party food. Our most popular and child friendly tip is: cover cartons of juice with masking tape, and add on googly eyes – or draw them on as we’ve done in the past. The end result is – Ta Da – ‘Mummy Juice’. This year though we’re branching out! I’ve already seen a great recipe for Cheesy Pumpkin biscuits, from Sainsbury’s, which I’m hoping will add a certain’ je ne sais quoi’, to proceedings. 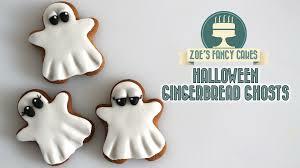 Until now, I would have baulked at making these, because of the shape, but with our Pumpkin Cookie Cutter, we should be on the money! 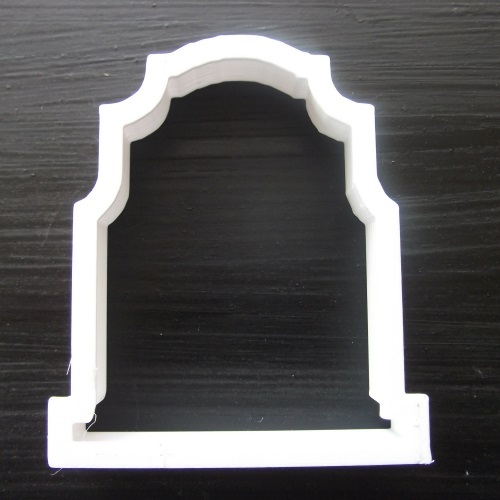 Our other Halloween Cookie Cutters are worth a gander too. I especially love the Witch Hat, as you can do so much with it. Wizards, Harry Potter – ice it any which way. 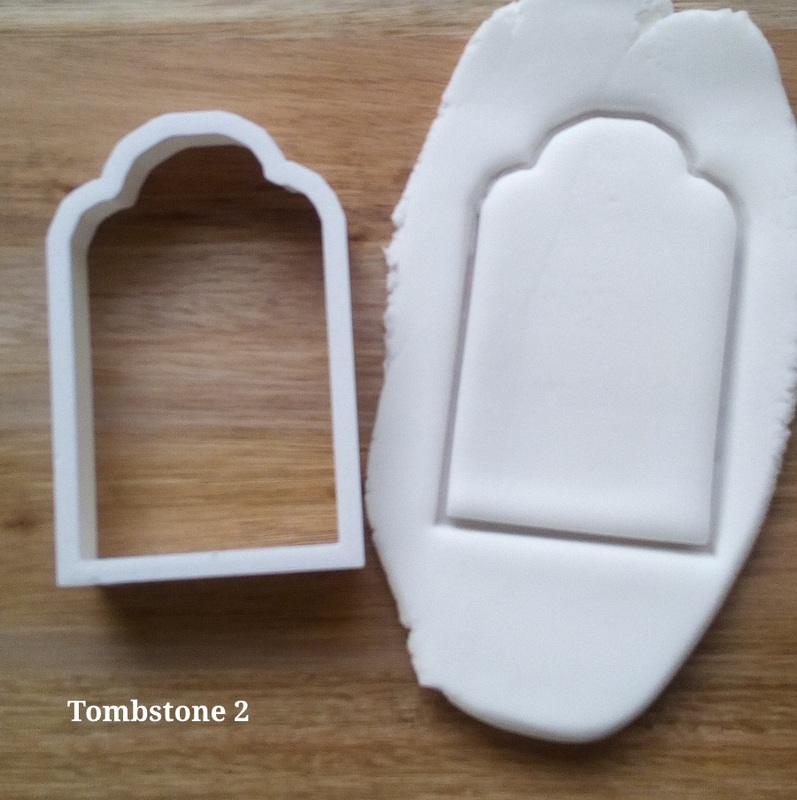 Or, if you’re feeling super spooky, we have a set of three (or buy them individually) Tombstones, including a nice goffick Celtic Cross. 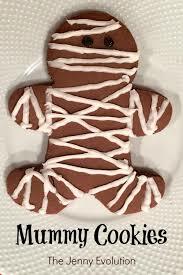 And don’t let the humble Gingerbread Man Cookie Cutter escape you. 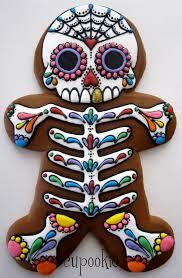 You can dress him up as a Day of the Dead figure, make him into a skeleton, Mummify him or turn him into a ghost. Put him to good use before Christmas comes. 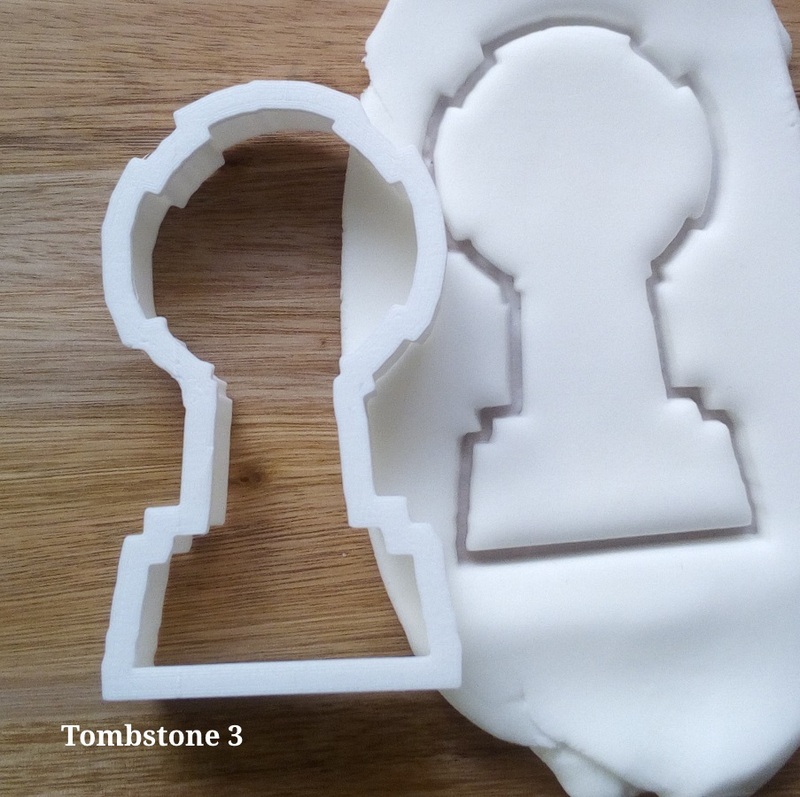 If you have your 3D Printer set up, now’s the time to get it primed for some Halloween inspired decorations. 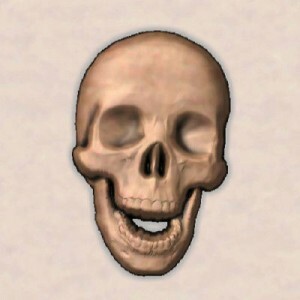 We found this skull STL File for sale on Ebay. 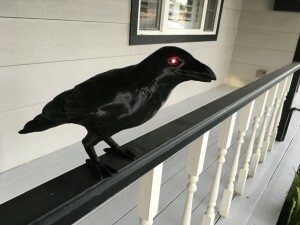 Or, how about this amazing crow from YahooJapan on Thingiverse, nice and creepy. Our final tip – and this one is new for us this year – centres around the mass sweet collection – or extortion – call it what you will! 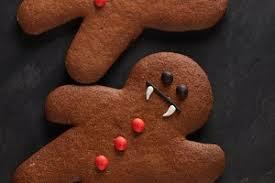 A few days after Halloween there’s always some sweets leftover, hogging space in the kitchen cupboard. Well – why not take this bountiful collection and add to your next baking of cookies/biscuits? 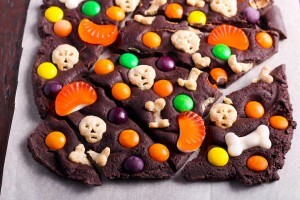 Just create your mass cookie, add the sweets on top and then bake. Take them along to your next office meeting. Surely nothing says resourceful than Haribo-embedded biscuits? Check out the idea here and you’ll need a cookie recipe. Don’t forget to share your cookie adventures with us on Instagram or Facebook. We love to see what you’ve created. Have a nice Halloween, keep safe and have spooktacular fun!